If stage 1 had served up vicious side winds as a starter to this year’s Tour of the North, stage 2’s 90 mile main course would add driving rain from the Ards peninsula coast. Legs were already feeling tired after an unscripted battering but there was little time for rest and there was no easing into the epic that was stage 2. 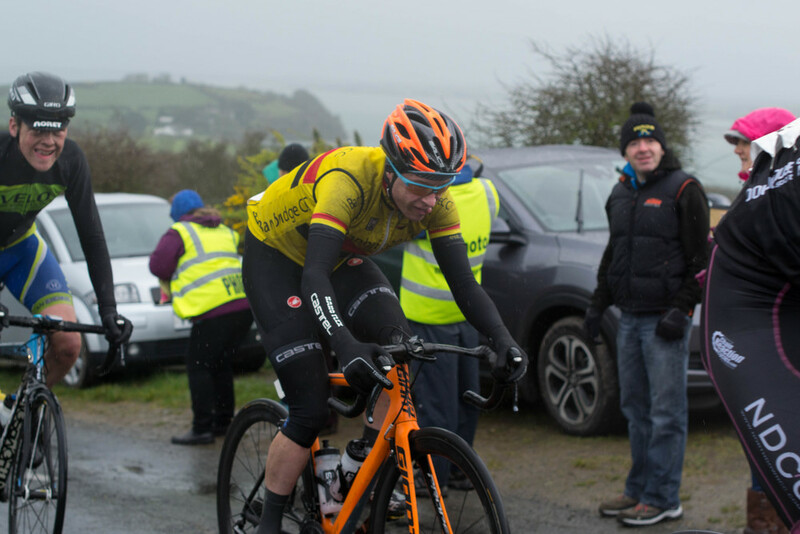 Within the first half hour the break of the day was established as the race hit Newtownards and the first KOH of the event. Lindsay Watson’s day was up and down, or maybe more down and up. He was caught up in a crash in the main bunch alongside the race leader and yellow jersey wearer, Ed Clements of Spirit Bike/England. A quick check of the bike and he was back on his way again however and regained his place at the front of the peloton with relative ease. It was the in-form Watson who was most active in the chase groups once the yellow jersey started to turn the throttle after 70 miles of racing and was in the thick of the main racing action all day. James Curry and Matthew Adair were also both very aggressive and could be seen covering breaks or putting in the effort to chase them down when required. Gareth McKee, like many others, struggled with the cold but stuck to the task at hand and despite having to return to the team car for a winter jacket and downing a days’ worth of energy gels in the space of 30 seconds was a contestant at the head of affairs and managed to make his way into the front groups as the race began to disintegrate in the closing miles. Curry also finished well up and by the time the race climbed Windmill hill for the 3rd and final time he crossed the finish line just outside the top 20 on the wheel of teammate Watson. Tomorrow the riders will face 2 stages, a five-mile time trial finishing on the Mountain Road hill (9am-11.30am) and a 66 miles road race from Portaferry to Newtownards, Killynether, Dundonald, Castlereagh Hills (Ballyhanwood road) Ballygowan, Balloo, Comber, Newtownards and the finish in Donaghadee (Warren Road) at approximately 4.30pm.